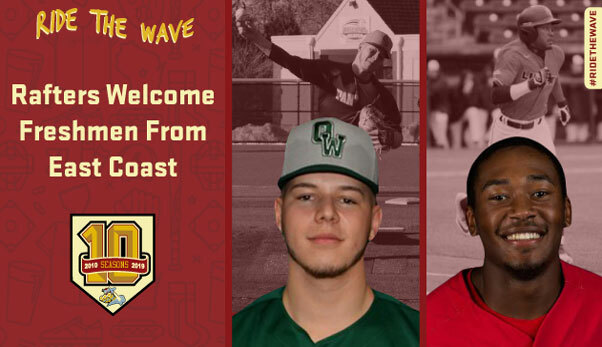 Wisconsin Rapids, WI- The Wisconsin Rapids Rafters have announced the addition of Liberty University utility player Jaylen Guy and Old Westbury right-handed pitcher Patrick Quinn to the 2019 roster. Guy, a true freshman out of Greensboro, North Carolina, has started all 16 games at center field for Liberty this season. He leads the team with nine stolen bases and is one of just three Liberty players to start every game. The six-foot utility player has hit .273 for the Flames, while driving in four runs and slugging .375. Jaylon started the season strong with two hits and scored three times in the opener. He has carried that hot start through the first half of the season as the Flames have taken down North Carolina and Wake Forest. Both teams are ranked in the top 20. In high school, Jaylon was a two-time all-state honoree at Southeast Guilford High School and was chosen as part of the 2018 All-USA North Carolina All-Star team. In addition, Guy was a multi-sport athlete at Southeast Guilford and earned all-state honors in football as a junior. Originally from Queens, New York, Patrick Quinn attended Robert F. Kennedy High School where he was a Public Schools Athletic League All-Star. This season, Quinn has totaled three appearances for SUNY College at Old Westbury. All three appearances were starts, where he has recorded nine strikeouts and surrendered seven hits over 9.2 innings of work. Old Westbury baseball was picked to finish sixth in the Skyline conference preseason poll and is currently 3-5-1 in Division III this year. Want to attend a Rafters game next season? Rafters 9-Game Ticket Packages are on sale now! Single single game tickets go on sale April 19th. For more information on all Rafters ticket offerings visit Raftersbaseball.com, call the Rafthouse at 715-424-5400, or come visit us over at historic Witter Field. The Rafthouse is open from 9:00 am to 5:00 pm, Monday through Friday at Witter Field, 521 Lincoln Street in Wisconsin Rapids.